The University of Wyoming Art Museum is located in the dramatic Centennial Complex on the university campus in Laramie, Wyoming. The Centennial Complex, which also houses the American Heritage Center, was designed by internationally acclaimed architect Antoine Predock and is a public building with spacious free parking for visitors. 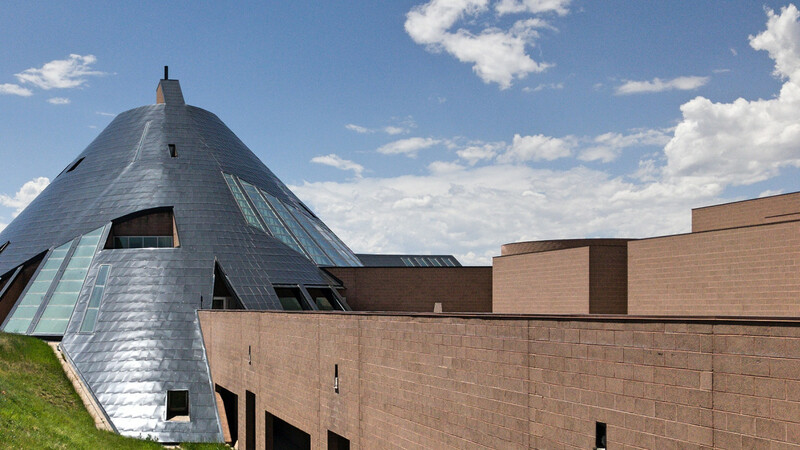 Supported by public and private funds, the University of Wyoming Art Museum was created to serve the people of Wyoming and those who visit the state. Museum exhibitions offer something for everyone and are displayed in an exciting gallery environment. Special programs, lectures, openings, workshops, classes, and tours are held on a regular basis. 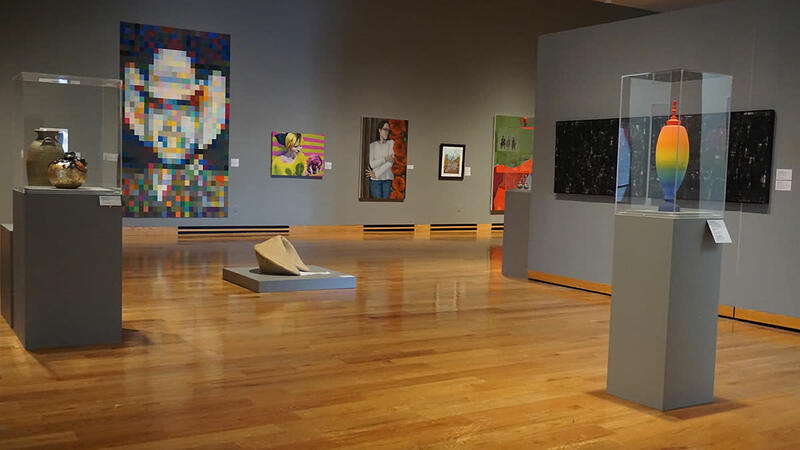 The University of Wyoming Art Museum offers a year-round source of education and entertainment for the entire family. Hours:Tuesday - Saturday, 10 a.m. to 5 p.m.Thursday, until 7 p.m.
Museum StoreOpen during regular Museum hours. 307-766-6622. Fully wheelchair accessible. Please call in advance for special assistance 307-766-6622. Group tours may be arranged in advance by calling 307-766-3496. The Museum does not refer individuals to private appraisers and conservators. Click here for a list of organizations. The University of Wyoming Art Museum is funded in part by Union Wireless; Genesis Alkali, LLC; TRONOX; BlueCross BlueShield of Wyoming; BP America; Cloud Peak Energy Resources; First Interstate Bank; Groathouse Construction, Inc.; Ivinson Memorial Hospital; Verizon Wireless; Premier Bone & Joint; Cheyenne Regional Medical Center; Rocky Mountain Power Foundation; the Guthrie Family Foundation; Exxon Mobile Foundation; Mendicino Family Trust; Mary Storer Foundation; UW Foundation; Albany County School District #1; Richard and Judith Agee; Daniel R Anthony; Stephen and Kathleen Beiber; Chris and Kathryn Boswell; Tom and Jacque Buchanan; Ross and Marial Bulmer; Rod and Maxine Chisolm; John and Esther Clay; Roy and Caryl Cline; Barbara Dilts; Patricia R. Guthrie; Mel Cox; E. Jayne Dooley; Jerald and Annie Dukes; Cynthia Kendrick; David Jones and Mary Hardin-Jones; Anthony Mandujano; Richard McGinity and Susan Berman; Frank and Barbara Mendicino; Gary Negich; Nick Murdock; Charles and Reta Ralph; Tom and Sandra Rardin; Pam Rentschler; Phyllis Shelton; Fred Von Ahrens; anonymous sponsors; Wyoming Public Radio; the National Advisory Board of the UW Art Museum; Diane E Bonner Memorial Endowment for Collections, National Advisory Board Endowment, Sherman W & Dorothy Burns Estate Fund, Casper Art Museum Fund, Lisa Lewis Dubois Student Exhibition Award, James T Forrest UW Art Museum Trust, Patricia Guthrie Special Exhibitions Gallery Endowment, Erma M Hill UW Art Museum Endowment, Anonymous Excellence Fund, Robert and Judith Redd Knight Endowment for Conservation and Acquisitions. Frank and Barbara Mendicino Endowment for Collections and Conservation, Ron and Patti Salvagio Endowment for Art Museum Programs. Sigrid See Excellence Fund for the Art Museum Teaching Institute, Ann Simpson and Family Student Exhibition Award; Lucile Wright Endowment; UW Office of the President, UW Office of Government & Community Relations; UW Office of Academic Affairs, UW Division of Administration, UW Office of Student Affairs; UW College of Agriculture and Natural Resources; UW College of Engineering and Applied Science; UW Department of Art; UW Libraries; UW Outreach School; UW MFA Creative Writing; Wyoming Community Foundation; and the Wyoming State Legislature; by grants from the National Endowment for the Humanities and the Wyoming Arts Council through the Wyoming State Legislature and the National Endowment for the Arts; and through the generosity of many individuals and businesses. Interesting, Eclectic Collection & Setting!